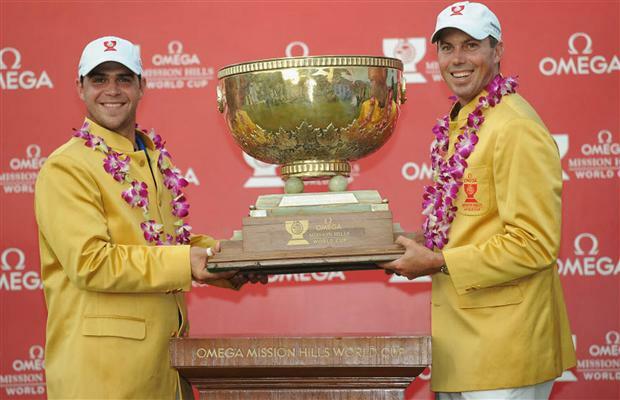 Gary Woodland and Matt Kuchar of USA with the trophy for winning the Omega Mission Hills World Cup at the Mission Hills’ Blackstone Course on November 27, 2011 in Hainan Island, China. Matt Kuchar and Gary Woodland gave the United States a 24th World Cup on Sunday after the duo reeled in overnight leaders Ireland and held off the charge of fast-finishing England. The victory at the Blackstone course comes a week after Kuchar helped the United States win another team event, the Presidents Cup, in Australia. The U.S. team fired a final round of 67 to take the title with a combined 24-under-par 264, two shots ahead of England and Germany in joint second place. Ireland’s Rory McIlroy and Graeme McDowell started Sunday with a two-shot lead but endured a frustrating day and carded an even par 72 for a share of fourth. Kuchar told reporters he was proud to have won the title for America. “You think of all the sporting events, and you think of all the teams that become world champions, and in golf there are not that many opportunities to be world champions,” he said. The American duo began the final round two strokes behind McIlroy and McDowell but moved to the top of the 28-nation leaderboard after birdies on the opening two holes and at the sixth and seventh. A bogey on 11 was the only blip but they rebounded with birdies on the 12th and 13th. Kuchar and Woodland cruised home to slip on the traditional golden jackets and take first prize cheques of $1.2 million. “On Saturday we really clicked together and played a great round and when Matt got up-and-down at the last that gave us the momentum into today’s final round,” Woodland told reporters. England’s Ian Poulter and Justin Rose produced the round of the day, a nine-under 63, to climb to second place on 22-under par with Germany’s Martin Kaymer and Alex Cejka (69). Poulter and Rose were eight strokes off the lead going into the final round but started their charge with four birdies in their opening six holes before playing the closing four holes in four under. “We … were a little subdued last night and neither of us were much company,” said Poulter. “We stayed in our own rooms, and kind of rightly so as four-under par in fourball was very disappointing. ”But to go and shoot nine-under par in foursomes is crazy. However, it was disappointment for Ireland for the second World Cup in a row after McIlroy and McDowell faltered when it mattered most. The pair had also been leading the event in 2009 but were overhauled by Italy on the final day. They had four birdies and bogeys for a level par 72, sharing fourth with Australians Richard Green and Brendan Jones (69), the Scottish duo of Martin Laird and Stephen Gallacher (66), and Joost Luiten and Robert Jan Derksen (68) of Netherlands. The Guatemala team of Jose Toledo and Pablo Acuna were celebrating their 27th place after a final round 70. They finished 11 shots better than Belgium.